Get your lost items back! Did you find a lost item? HOW IT WORKS - IT ONLY TAKES 2 MINUTES! 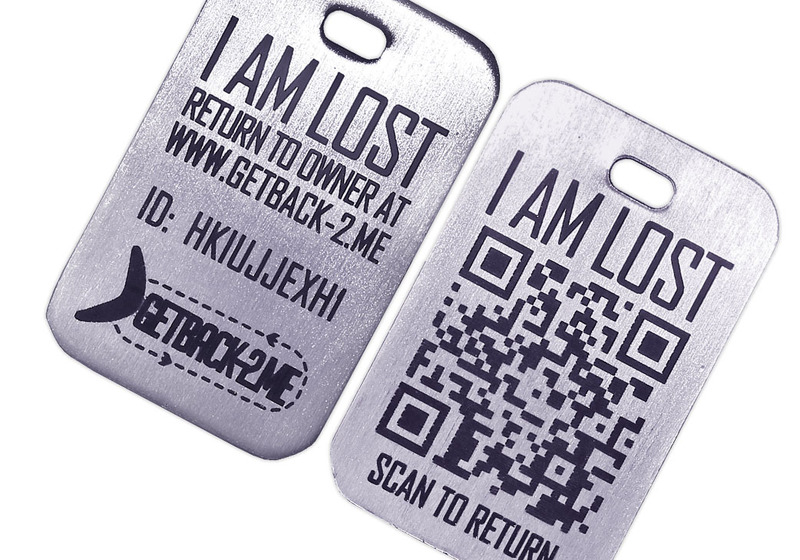 Purchase Stainless Steel or Sticker Tag, with unique QR-code and unique ID, on www.getback-2.me or in a store. Scan QR-code using mobile phone or manually enter ID on www.getback-2.me to activate tag and link tag with your e-mail address. You can provide a “message to finder”, which will be shown to finder, if you one day lose the item. You can also provide a name for the tag, which you can use to identify the tag in the system. The name will not be revealed to a finder. Attach Stainless Steel Tag or Sticker Tags to your item(s). The tag(s) works with anything where it can be attached securely by the key ring or wire (included with the Stainless Steel Tag) or which the Sticker can be glued onto. If you lose or forget your item, you have now a better chance of retrieving it, as you have attached a Stainless Steel Tag or Sticker Tag to it. If someone finds your item, the Stainless Steel Tag or Sticker Tag will clearly notify the finder of what they need to do. The Getback-2.me system sends a secure message to you (finder will not get access to your personal information). You can also read these messages directly on www.getback-2.me. You can communicate anonymously back-and-forth with the finder through the Getback-2.me system. Thereby you can arrange for pick-up of your item(s) without the finder ever getting access to your personal information (or you can arrange pick-up using phone if preferred). You can meet finder or pick-up item(s) at finder’s address – or maybe even have finder send the item to you (if the item is not keys or similar). Just order a Stainless Steel Tag or a package of Sticker Tags, with unique QR-code and unique ID, on www.getback-2.me or purchase it in a store. Here you can read more about how it works. Do you have retail shops or distributors around the world? Yes, we sell the Getback-2.me products from retail shops around the world and is constantly working on expanding the numbers of stores carrying our products. The company welcomes proposals from distributors and retailers around the world. Please contact us for further details. Which information does Getback-2.me store about the owners/users? The Getback-2.me system only stores the owners e-mail. The e-mail is stored securely in the Getback-2.me system and will not be revealed to a finder. <b> You can chose to store your shipping and invoice details in the shop (by registering an account), but these information is kept in a separate system for the shop which is not mixed with the data for the "lost-and-found" system. Is the owners contact details hidden to finder? Yes, Getback-2.me only stores the owners e-mail. The e-mail is stored securely in the Getback-2.me system and will not be revealed to a finder. The owner can use the Getback-2.me system to communication anonymously with the finder. <b> You can chose to store your shipping and invoice details in the shop (by registering an account), but these information is kept in a separate system for the shop which is not mixed with the data for the "lost-and-found" system. What if my sticker tags fade out or my stainless steel tag breaks? In case your tag breaks or is worn more than could expected from the specific way it is used, then Getback-2.me will happily replace your tag for free for the period of 2 years from date of purchase. Please contact us in case you have a broken tag you need to have replaced. What is the shipment time? Shipments inside Denmark will take 3-4 days with regular mail. International Airmail will take 4 to 10 days depending on regions and continents. All products are shipped directly from Copenhagen, Denmark. As many as you wish - it is simply unlimited. Every single user can register an unlimited number of IDs in Getback-2.me system. Does Getback-2.me services work worldwide? Yes, if owner loose his/her item anywhere in the world, the finder can report it using the Getback-2.me system and the parties can exchange information with each other to exchange the item. It is important to note that Getback-2.me does not get involved in shipment of any item or does not communicate with phone with any parties to return the item. You can either scan the QR codes directly with your mobile phone or go to www.getback-2.me/activate. Can I hand over or give my tag to another person? I forgot my password  what do I do? Please go to the login page and reset your password. An e-mail will be sent to your e-mail address which can be used to reset the password. <br> Please notice that the password for the Getback-2.me system can be different from the password to our shop as it is two independent systems and accounts. I forgot which e-mail address I used for my account what do I do? First please go to the login page and press forgotten password. Then follow the instructions and type in you Tag ID. An e-mail will be send to the e-mail address associated with the tag, so please check your various e-mail accounts. <br> Please notice that the e-mail for the Getback-2.me system can be different from the e-mail to our shop as it is two independent systems and accounts. Do getback-2.me tags prevent theft? No, not on their own as our QR-tags and stickers primarily are designed for situations when the owner accidently forgets or loses his items. To prevent theft, you will need other measures such as DNA marking or engraving. The advantage of engraving your getback-2.me ID rather than personal details is that you may pass on the device with ID to another owner (if you decide to sell or give away your item). Are people really so honest that they will hand back my lost items? Often people are more honest than most people think. When we fear losing our things we normally think about theft. However, many times when we forget or lose something, the item is often picked up by an honest person who only wants to help bring the item back to the rightful owner. Every year, many keys, iPads/tablets, mobile phones and other personal belongings are handed in to public Lost & Found offices by people who just want to help. The vast majority of the population wants to help - especially if it doesn't require too much effort hence the Getback-2.me solution is ideal by making it easier for a person to return your lost items. Couldn’t I just use homemade tags and stickers? The good old-fashioned name sticker that you might have attached to some of your belongings in pre-school might still work well in some situations. However, homemade stickers are rarely very durable for a wider range of uses. 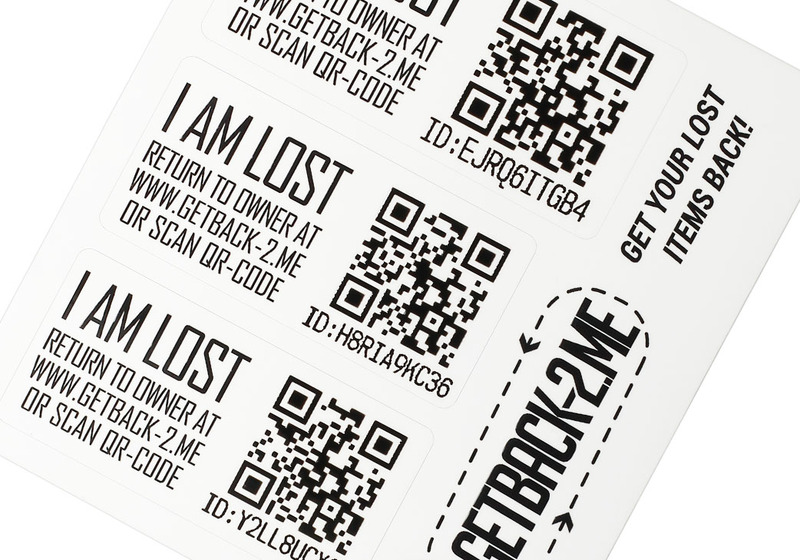 The Getback-2.me stickers and tags are very durable and will last much longer. Furthermore, when it comes to keys, one should never attach a name, phone number, or other personal information. The same goes for other personal belongings where it would be nice to stay anonymous. If you want to make it easy for finders to help get your lost things back, it is an advantage that the tag you choose carries a QR-code that can be read by a smartphone. Furthermore our website is in several languages (and more are coming all the time) which make it easier if you lose you belonging abroad. How do I scan QR-codes with my phone? In order to scan QR-codes you need a smartphone with a QR-scanner app (QR-scanner apps can be downloaded and installed from Google-Play or AppStore. If you don't have a smartphone, you can still use our solution. All you need is to use the ID-code from the tag instead via our website www.getback-2.me. It works just as well as the QR code. I activated my new tag but did not receive a confirmation mail from Getback-2.me? Unfortunately, some e-mail systems classify real useful e-mails as spam. Please look in your spam folder to see if you have the e-mail from us there. If this is the case, please move the mail to your regular folder. In some e-mail system, this will increase the likelihood that this will not happen in the future. You should also add getback-2.me to the list of secure senders/domains such that mails from us in not classified as spam in the future. I have lost my item but I have not received any e-mails telling me that the item has been found? Unfortunately, some e-mail systems classify real useful e-mails as spam. Please look in your spam folder to see if you have the e-mail from us there. If this is the case, please move the mail to your regular folder. In some e-mail system, this will increase the likelihood that this will not happen in the future. You should also add getback-2.me to the list of secure senders/domains such that mails from us in not classified as spam in the future. You can always log-in to your account to read your messages. I have reported a lost item, but did not receive an e-mail with and answer from the owner? Can the tag be used on another item or handed over to another user? Yes – the stainless steel tag can just be moved to another item. You can consider updating the name of the tag and the message to the finder, such that it match the new item. You can also hand over the tag to another user by de-activating it. The new user can then activate it and associate it with his/her account. Didn't find your answer, let us know.